Question: May one discard of a Tzitzit garment or Tzitzit strings in the trash after they have been worn out and there is no longer any use for them? Answer: Our Sages taught us in the Baraita in Masechet Megillah (26b) that articles which have innate sanctity may not be thrown out in the trash; rather, they must be buried respectfully with other articles of holiness. However, an item which has no innate holiness (and was used for a Mitzvah) need not be buried and it may be thrown in the trash. The Baraita (ibid) continues, “These are some examples of items used for a Mitzvah which retain no innate holiness: A Sukkah, Lulav, Shofar, and Tzitzit.” Thus, a broken Shofar or a Lulav after the holiday of Sukkot may be discarded in the trash and there is no obligation to bury them. On the other hand, articles which have innate sanctity, such as Tefillin and Mezuzot, may not be discarded even when they become invalid and they must be buried in accordance with Halacha. 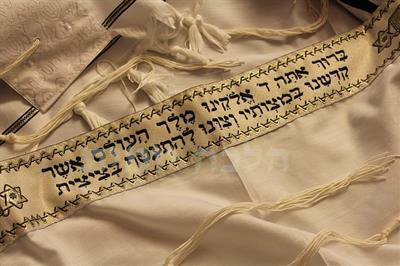 Nevertheless, Maran Ha’Shulchan Aruch continues and writes that as long as the Tzitzit are still attached to the garment, one may not use them for any mundane purpose, such as using them to tie something, for this constitutes a degradation of the Mitzvah; only after they are torn may they be used for a mundane purpose or thrown in the trash. Indeed, there are many opinions regarding this matter, for some say that that one should act stringently and not throw the Tzitzit garment in the trash while others are of the opinion that one need only be concerned regarding the strings themselves (see Halacha Berura ibid). Even Maran Ha’Shulchan Aruch rules stringently regarding a Tzitzit garment and states (ibid Section 2): “One may not wipe one’s self with a Tzitzit garment nor may one designate it for use in a degrading manner.” The simple understanding of Maran’s words would imply that one should act stringently in this matter regarding the strands as well (Maran Ha’Chida understands likewise in his Birkei Yosef). It is therefore customary not to throw a Tzitzit garment or Tzitzit strings in the trash after they are no longer usable. If one finds it necessary to dispose of them in the trash, one should place them in a separate plastic bag on their own and then dispose of them respectfully.